Professor Stephanie Luce, a co-author of a new Occupy Wall Street study, takes issue with the media harping on the high household salaries reported in the study. A new study by sociologists at the City University of New York on the Occupy Wall Street movement recently captured the media’s attention, mostly due to the researchers reporting that more than a third of the people who participated in the NYC chapter of the movement came from households with annual incomes of $100,000 or more. “Study shows that the Occupy Wall Street kids were ‘the children of the elite’. What a surprise,” a Telegraph columnist sighed. 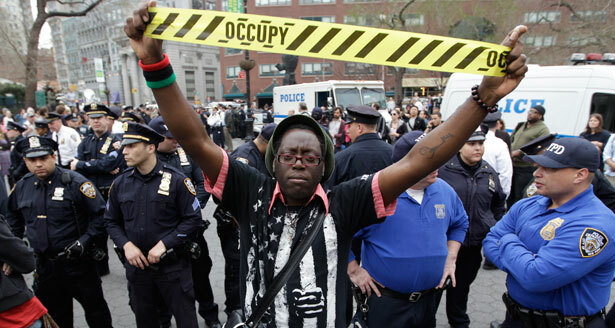 ”Many Occupy protesters well-off, white and educated, study says,” the Los Angeles Times reported. The Gothamist opted for a slightly more diplomatic headline: “Study: Occupy Movement Well-Off, Educated, But Still Stung By Bad Economy”. Setting aside the fact that this was a damned if they do, damned if they don’t moment for Occupy—they’re either poor, dirty hippies or the sons and daughters of the wealthy elite, but never, ever Americans exercising their First Amendment rights—the narrative constructed by the media simply isn’t true. Even one of the study’s co-authors takes issue with how the media is interpreting the study. Professor Stephanie Luce emphasizes emphatically that the data represent household income—not individual income, an important distinction to keep in mind because the data skews higher than real income for Occupiers. “The problem was we did not end up reporting on individual income. About a quarter of our respondents earned less than $15,000 a year, but since many of them were students, we weren’t sure if that would be misleading and if that would be a level of detail that would take a lot to go into describing those households,” says Luce. The study does attempt to be nuanced in its report of the Occupy movement in other areas, including the fact that nearly a third of the protesters had been laid off or lost a job. A similar number said they had more than $1,000 in credit card or student loan debt. Another important under-reported detail is that the sampling of 700 people at a May Day rally in 2012 was an atypical Occupy event that attracted a diverse crowd, including many activists from labor groups (there is overlap between Occupy and labor, but the event also attracted individuals who were unaffiliated with Occupy). “We know from our data that a lot of the people there were union members or academics, people with professional occupations. In that sense, I wasn’t surprised by the education levels and the income levels because those are the people who can come to that kind of rally at four o’clock,” Luce says. It would have been interesting to contrast the May Day findings with the population of the Zuccotti Park camp, but unfortunately the CUNY professors (Luce co-authored the report with Professors Ruth Milkman and Penny Lewis) weren’t able to secure their grant until after the camp had been evicted by the NYPD. Luce agrees with critics of the study who point out that the May Day rally was an atypical event. Luce expressed dismay that the media have seized upon the $100,000 annual salary detail of the study—partly because shaping the narrative around that finding is misleading, but also because, in Luce’s opinion, that shouldn’t be the biggest takeaway. Most importantly, according to Luce, is that the study shows the concerns of protesters aren’t going away any time soon. For more on dubious media coverage of popular protest, read Allison Kilkenny’s post on the presidential inauguration.